Florida State Capitol in Tallahassee. 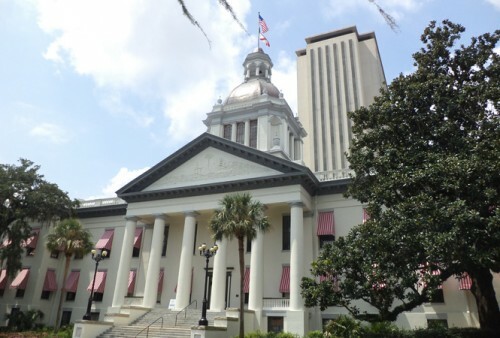 TALLAHASSEE, Fla. — Florida’s nearly four-decades old ban on gay adoption – which has already been struck down by the courts and is no longer enforced – could be repealed under a bill now headed to the governor’s desk. The ban was first put in place the same year singer Anita Bryant led a highly publicized campaign to repeal a Miami-Dade ordinance that outlawed discrimination based on sexual orientation. The Florida Senate passed the bill Tuesday on a 27-11 vote, but not before several Republicans questioned getting rid of the ban. Sen. Don Gaetz, the GOP sponsor of the adoption bill, called the current ban “meaningless” because it is no longer enforced. An appeals court ruled it unconstitutional in 2010. Sen. Jeff Clemens, who told senators that he was adopted after being born to a 16-year-old single mother, said the legislation would wind up helping children. “I understand that you have issues between you and your God, but I would tell you I think your God would want you to give an opportunity to those hundreds of children across the state of Florida that need a second chance,” said Clemens, a Democrat. The bill was designed initially to increase financial incentives to those who agree to adopt children. It would also make it clear that the state cannot deny an adoption if a family wants to home-school their children. The House has passed a separate “conscience” law that would allow faith-based organizations handling adoptions to refuse to allow gays to adopt. It’s not clear if the Senate will pass the measure.